Logistics/embarkation specialists—Military Occupational Specialty 0431—are charged with preparing supplies and equipment for embarkation. 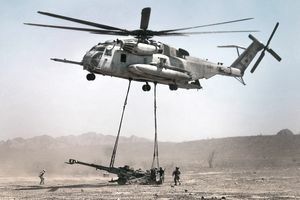 These marines perform various force deployment planning and execution functions to support the movement of people and goods across all modes of military transportation. Logistics/embarkation specialists are trained in the application of Automated Information Systems, known as AIS. These systems are utilized throughout the Defense Transportation System or DTS to account for, track, and interface movement data with load-planning programs. These specialists are also trained to prepare aircraft and shipload plans that meet organizational requirements. They assist with the preparation, planning, and execution of strategic mobility plans in accordance with the Time-Phased Force Deployment Data or TPFDD that's used to deploy and sustain forward deployed forces. They will also serve as combat cargo assistants aboard naval amphibious assault ships at the senior or staff non-commissioned officer level or SNCO. MOS 0491, the Logistics/Mobility Chief, is assigned as the primary MOS upon promotion to Gunnery Sergeant. You can refer to MCO 1510 61, Individual Training Standards or the Training and Readiness Manual, for a complete listing of duties and tasks for this position. Logistics/embarkation specialists can participate in the United Services Military Apprenticeship Program known as USMAP. This official military training program offers active duty Navy and Navy Reserve Full Time Support or FTS service members the ability to enhance their job skills and to complete their civilian apprenticeship requirements while on active duty. The U.S. Department of Labor provides the nationally recognized "Certificate of Completion" once the program is finished. USMAP gives Marines and other servicemembers an opportunity to upgrade their job skills. It also shows their motivation for taking on more challenging military assignments. Having a DOL Certificate of Completion is beneficial for getting better civilian jobs because employers recognize the value of apprenticeships and the initiative required to accomplish them.